Having been through post-partum depression myself, I am fully conscious of how long the days can feel when you are home alone with a baby. Even seconds can feel hours long. Counting the hours left in the day until your partner comes home can induce panic and tears. I have been there. So on this, the longest weekend of the year, I'd like to raise a little awareness for mamas working hard each day to conquer PPD and love their little babies. During one of the PPD group sessions I was in, our social worker read us the poem below. It was initially written to describe the experience of raising a child with a disability. I had never heard the poem before, so when it was first read to me, I didn't know this and felt it applied to my PPD just as perfectly. I still can't read it without tears in my eyes. To the mamas out there climbing out of the darkness, I'm thinking of you and sending you love and courage along your way. Do you follow Eleanorisms on Love Taza? If you don't, you absolutely should. Seeing the world through the eyes of a little one is by far one of the best parts of my day. In the same spirit, I'm starting Sebastianisms. Little things that Sebastian says that just completely melt my heart. Enjoy. On a dark, rainy day I picked him up from daycare and he said, "I want it to be wake up time outside." While looking at a deflated Mikey Mouse on our neighbour's lawn...."We need to put more sky in it." Me - "Sebastian, why don't you want to sit on the potty?" S - "Because it scares me." Me - "Why does it scare you?" S - "Because it's dangerous." Last week he said to me, "Do a medium kiss, Mommy." (not too big or too small). And then a few weeks before that "Put a hug on me, Mommy." True story - Sebastian will happily eat brussel sprouts if they are drowned in ketchup. So, naturally I stress about whether this is a good thing or not. I asked my friends and the overwhelming response was, "Absolutely. It's actually 2 vegetables, brussel sprouts and tomatoes." And a few weeks ago Sebastian sat in his craft room playing on the iPad, not crafting. So, yeah, I'm not winning any supermom prizes over here. And that's totally ok. I want to be a good mom. I want to be a great mom. Sebastian thinks I'm a super mom, so that should be enough right? However, it's so easy to feel like you can always be doing more. 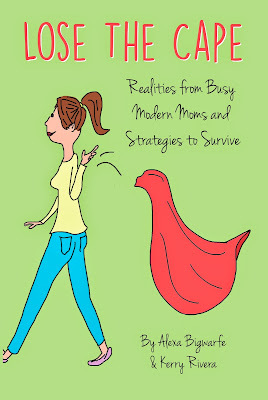 If you ever feel the same, then you should check out this book - Lose the Cape: Realities from Busy Modern Moms and Strategies to Survive. This book will remind you that you're already an amazing mom and give you a few tips to make life with a little one even easier! It's completely non-judgmental. The authors, Alexa Bigwarfe and Kerry Rivera aim to bring moms together instead of asking them pick a side on the controversial topic of the day. What is also super great about this book is that the chapters are short and easy to read which is prefect for motherhood, because short time slots are pretty much all I have available as a mom! Reading Lose the Cape is like having a friend lean over and whisper, "It's all going to be ok. You're a great mom. You love your children and are, therefore, giving them exactly what they need." - Encourage your little one to have "one bite" of everything on their plate as opposed to a "no thank you bite". Children's taste buds change as they develop, so it's important to keep encouraging them and not think of food as something they won't like. - Use a shared Google Calendar between you and your partner to manage all of the household schedules. We actually do this, and it's a lifesaver! - To schedule exercise/gym time, book it in with friends. This way you're committed. - I also really loved the sections on nurturing your marriage while in the thick of the parenting phase and discussion on mommy friends: which to keep and which to let go. 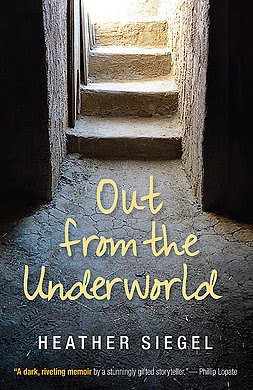 Alexa and Kerry were kind enough to answer a few questions I had for them after I read their book. 2. What's the craziest parenting moment you've experienced so far? How did you get through it? Kerry - There are so many. I hate it when my kids are sick, and those instances certainly offer ugly tales to share - from catching kid vomit with your hands to cleaning it up in the car to ear infections that always seem to strike at 2 a.m. on Saturday night. You just need to get through it. Just a few months ago, our family was departing for my sister's baby shower, which I was hosting, and my middle son threw up 10 minutes before we needed to get in the car. My daughter decided to "organize" all of my decorations, so I needed to go searching for missing items throughout the house, and my oldest son said he felt carsick on the drive there. We called in grandparent reinforcements and joked that we should have been taping the chaos. This is parenthood! This is what I needed to share with my sis. With three kids, we are always experiencing new and crazy moments, but the good outweighs the bad. 3. How has being a mom changed you? Kerry - I think it has mellowed me out and put things in perspective. In fact, I think it has made me a better professional. I am more patient in the office. I don't stress easily. I recognize there will be another day to get it right. Being a mom has softened me. Sure, there are days my kids drive me absolutely mad, but I love them so much. I love the family my husband and I've created - chaos and all. It has also intensified my worrying gene. I want to get it right with my kids, so sometimes I tend to agonize over decisions, but I'm getting better at trusting my gut and having faith. 4. What are your thoughts on screen time for little ones? Alexa - Hmmm. Well, I know what studies tell us we should not do. In fact, we just had a huge debacle because of screen time issues (http://katbiggie.com/total-reset-required/) but I do try to limit the amount. We didn't introduce tv to our oldest until he was almost two. Sadly, this was not the case with 2 and 3. I work from home, so my kids get more screen time than they should, but I limit it to no TV after dinner. 5. What's the #1 piece of advice you'd give to new moms? Kerry - Listen to your gut. You know what's best for you and your child. So many new moms read anything and everything to try and do it right. And your friends and family will likely offer more "suggestions." You might pick up some great tips, but always go with your gut. You'll know what to do, and if you make mistake, there will be another day. Be kind to yourself. Thanks, Alexa and Kerry! And here's the link again if you'd like to check out their book. Disclaimer – I was sent a complementary copy of Lose the Cape for review. All thoughts and opinions about this book and wonderments about motherhood are my own. Consider this "Motivation Monday." Here are my 10 favourite workout songs! I hope you find one or two that you love and add it to your workout playlist as well!